Cottage in Magneville, Cherbourg, Manche, Normandy, France - Enjoy Being Immersed In French Country Life! This secluded stone cottage is ideal for those who enjoy nature and the tranquillity of the countryside. With no immediate neighbours and set down a country lane near the village of Magneville, you will have the space and peace you need to unwind. For those who enjoy physical activities, we recommend cycling, river and sea-based water sports as well as walks. If you love the beach, the nearby coast (25 mins) offers countless empty beaches on both sides of the peninsula. If you wish to visit the Channel Islands, you can catch the ferry from Dielette or Carteret. This is easily doable in a day-trip and sailings depend on the tide. In terms of eating out, we have our favourites both on the coast and inland and we can guide you to these. We are a young professional family based in London with a love of France and the French culture. Alex is half French and speaks French fluently. We bought our house in Magneville in 2008 from Alex's mother, who wished to sell the property. She had owned the cottage since the late 1980s and had only partially restored it at the point of our purchase. When we took the house, the upstairs was still a large, open attic area, with iron supporting rods running across the entire length of the building to support the gables. We subsequently lowered these to the floor level and built the upstairs bedrooms, WC and bathroom as well as a new staircase (2009). We also built a terrace to the rear (2009) and the kitchen was moved to the central room on the ground floor and a new kitchen fitted (2010). What we love about the house is the ability to completely escape our busy lives in London and enjoy our own space and beautiful natural setting. There is a great deal of space here and we enjoying nothing more than spending time together as a family in this setting. We have taken many a cycle ride to Bricquebec and Saint-Sauveur-le-Viscomte as the old disused train line, which runs between the two towns was turned into a long tree-lined cycle-route by an EU project. We also love the huge unspoilt beaches, beaches so vast, they could never get busy! Our favourite spots are around Portbail and Carteret. There are countless excellent restaurants both locally and on the coast. We will share our favourites with you if you choose to say at the house. This was our second visit to this beautiful cottage in the middle of the countryside in the heart of the Cotentin. The house had everything we needed including a big garden for our dogs to run round in. It's about 25 minutes drive from either coast but we preferred the west coast of the Cotentin, particularly Lindbergh Plage where the walk across the dunes is fantastic. No local shops but supermarkets at Bricquebec and Valognes about a 15 minute drive away. Also a good selection of restaurants within a reasonable drive and to round off the evening, a drink on the terrace at the house which captures the sun in the afternoon and evenings. Being so far west, it's light until almost 11pm! So if you want peace and quiet in a beautiful location, I would highly recommend. Alex, the owner has always been really helpful too. We had been to this part of Normandy before but this time wanted to bring our dogs and find a property where we were in a rural area but still close enough to the beaches to go for walks etc. This was perfect for us. The cottage is situated in a quiet lane and your nearest neighbour is about quarter of a mile away. It's a two story stone built property with loads of character and also has a lovely garden /paddock which was perfect for our dogs to run round in. There's a lovely living room with a stone fireplace and a wood burning fire, a well equipped modern kitchen and a wc and shower on the ground floor. Upstairs there is a beautiful bright and airy master bedroom, a second bedroom, a WC and a bathroom. All very comfortable and well maintained. At the back of the cottage there is a patio area with table and chairs, perfect for sitting out with a glass of wine on those long summer evenings. Although there are no amenities in the village about 1km away, Bricquebec is only a 15 minute drive away and it has everything you will need. We thoroughly enjoyed our stay and felt so relaxed there, listening to the owls at night, seeing beautiful birds of prey flying above us and just immersing ourselves in the beautiful countryside around us. Special mention to Alex the owner who was a joy to deal with and who was kind enough to provide recommendations for eating out and places to visit etc. Highly recommended, good value for money and would definitely visit again. 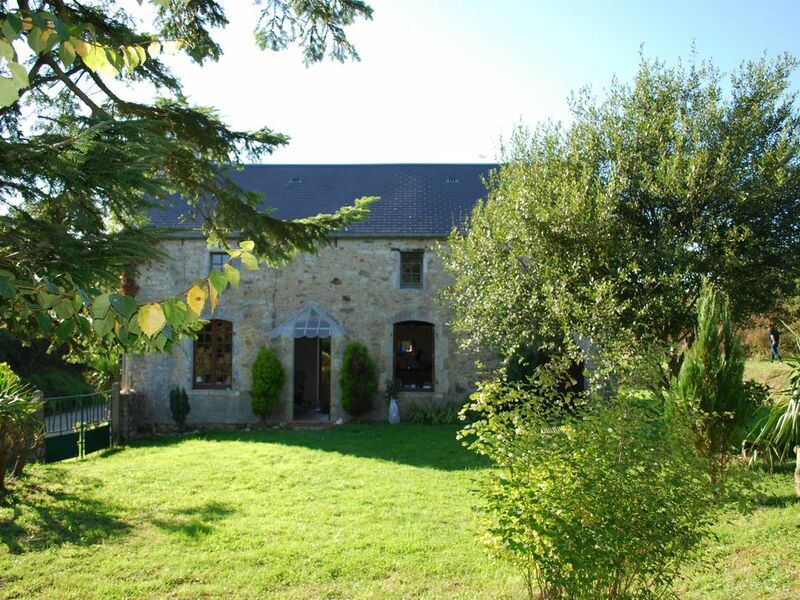 A beautiful cottage full of rustic charm in the perfect location to discover the delights of Normandy. The cottage is beautifully presented; spotlessly clean and the gardens were brilliant for our two dogs. The cottage is about 25mins from the most stunning beaches, again perfect for our dogs to run along as they never get crowded. The booking process was made very easy and the welcoming 'extras' were much appreciated. I would highly recommend to anyone who enjoys peace and tranquillity and we are hoping to go again next year. A truly fabulous holiday! Charming converted farm house recently converted in French countryside crossed with John Lewis Home styling. Very remote typical French hamlet location with abundant wildlife in the grounds including slow worms, shrews, owls, bats and toads. Very professional service by owners and local agents. Would recommend for a 'get away from it all' break. Auf der Suche nach Abgeschiedenheit und Ruhe ist man hier perfekt aufgehoben. Abends wird es in der Lage allerdings etwas früher kühl. Schöne Strände gibt es jede Menge in beide Richtungen. Auch das Cap oder der Mt St Michel sind als Tagestouren erreichbar. Wir hatten eine tolle Zeit.